Z1R’s Flank helmet is an attractive lid with a super-smooth finish, excellent comfort and clever venting. It has safety covered as well. As soon as we took the new Z1R F.I. Flank dirt helmet out of the box, we were impressed. The finish is ultra smooth and glossy, and there is no hint of a transition between colors in the attractive graphics. Rather than plastic screws holding the peak in place, it has what looks like black-chromed metal hardware. Instead of plastic grates on the helmet vents, there is a fine mesh metal screen. The rubber trim around the eyeport has molded-in goggle strap guides. It is available in four colorways, and it looks like a high-end, high-price helmet but without the high price. 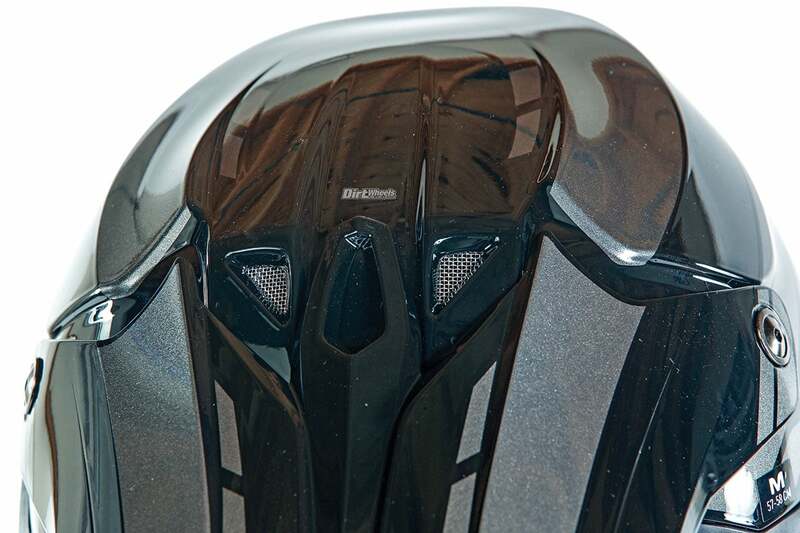 Beginning with a tough injection-molded polycarbonate shell (used in many bulletproof windows), the helmet pays even more attention to safety than it did to style and finish. Nine air intake points and three for the exhaust are molded into the sleek shell. Inside the shell is a multi-density expanded polystyrene (EPS) liner to absorb impact. The shell keeps foreign objects from getting to your head, and the padding inside is largely for comfort. The EPS is the hero that does the heavy work of head protection. It crushes to absorb energy. This EPS is equipped with MIPS technology which is a Multi-directional Impact Protection System that allows some slippage between the EPS and comfort liners. If the helmet catches on something or suffers some other rotational impact, MIPS minimizes how much of that rotational force gets to your head. 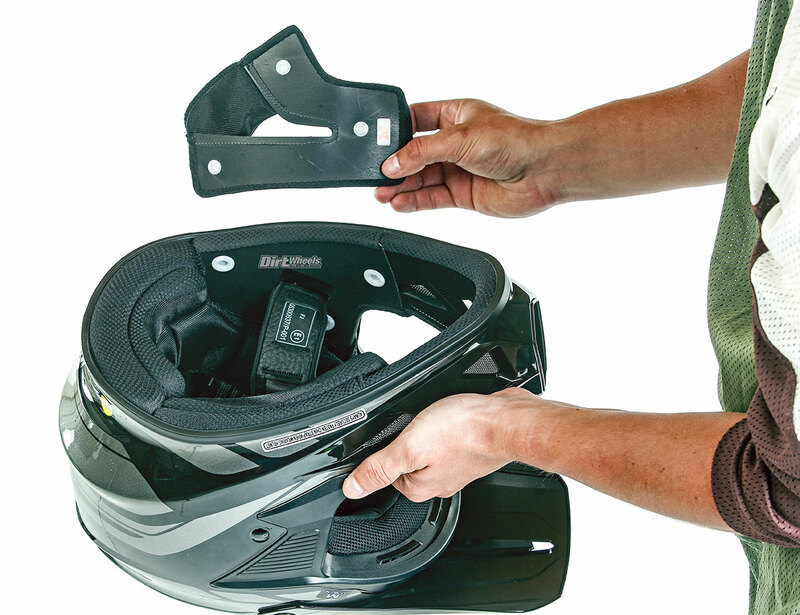 Every MIPS helmet must license the technology, so it isn’t often seen at this $160 price point. Metal mesh covers the vents in the helmet. They pass air but keep other assorted items out. Air channels are molded into the EPS to allow the air intakes to feed cooling air through the inside of the helmet. In our opinion, the helmet lines and graphics look best with the peak fully up, but it does adjust smoothly and easily if you prefer more shading for your eyes. You will find that the large eyeport allows an excellent field of view, and it has room for the largest goggles. Inside the helmet the comfort padding all snaps out and back into the helmet. We like that, and it comes out easily for cleaning and goes back in with little drama. There are two shell sizes and two EPS sizes, or, in other words, two main sizes that are refined into size extra small through 3XL. The additional sizes are handled by varying the comfort liner sizes. Naturally, the Flank meets or exceeds DOT and ECE 22/05 helmet standards. The inner comfort liner is easy to remove and clean on the Flank helmet. Sizes are XS to XXL, and no matter what the size, the price is $159.95. Sizing of the large through XXL run a size smaller than usual, but our medium helmet was roomy. The helmet is easy to put on and take off. The interior feels as nice on your noggin as the shell finish feels to your hands. There is even some clever comfort padding on the end of the helmet strap. In addition, the remaining helmet strap has a snap to tie it down. Quads and UTVs can generate enough speed to flutter a helmet strap hard enough to make it painful on your neck, so we like the snap. The helmet is very stable on our heads (one of the points the Z1R manual says is critical for a safe fit), and it isn’t bothered by wind buffeting. 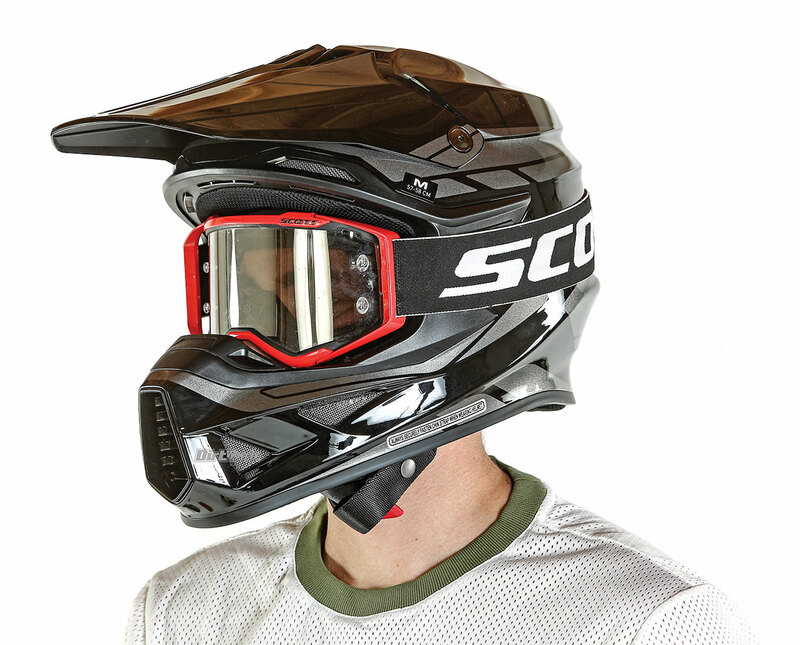 We love helmets with face shields, but when it is hot or dusty, goggles are still a great choice, and they fit comfortably in the Flank eyeport. This helmet offers a quality look and feel with above-average comfort and venting. We like the safety features and the certifications. There are cheaper helmets, even from Z1R, but the F.I. Flank looks great and offers a lot of value for the money. To see more offerings from Z1R, go to www.z1r.com.